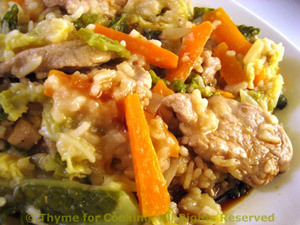 Chicken and Savoy Cabbage Skillet, quick, easy dinner recipes. I've been working on more 'skillet' dinners: everything cooking in the same pan. Nice for a busy season. This simmers a bit longer than the rice alone takes to cook, as it's not covered with liquid to start.